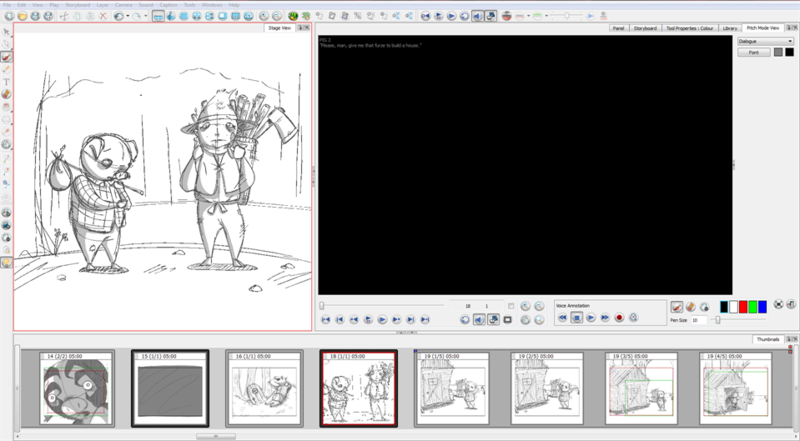 In Storyboard Pro there is a Pitch Mode view as well as the Pitch Mode workspace. This behaves in almost the same way as the Pitch Mode workspace, but provides access to the other views and menus. When the Pitch Mode view is part of your workspace, all the tools and functions that cannot be used in Pitch Mode will be dimmed. You will no longer have access to your drawing layers. To return to the normal mode, you must close the Pitch Mode view completely. ‣ Select Windows > Pitch Mode View. ‣ In the Panel view, select Pitch Mode from the View menu. ‣ Click the Close button.